Legend of the Guardians: The Owls of Ga'Hoole (2010) is an animated fantasy and adventure movie based on the Guardians of Ga'Hoole series. 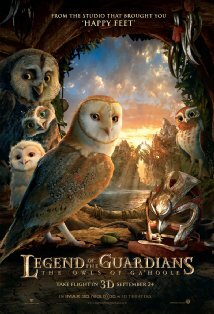 Synopsis: Soren (voiced by Jim Sturgess) is an owlet who's enchanted by his father's narration about a legendary group of heroic and mythical warriors known as the Guardians of Ga'Hoole. These legendary guardians once fought and protect the weak from an evil army called the Pure Ones. When Soren and his brother, Kludd (voiced by Ryan Kwanten), along with many other owlets are kidnapped by the Pure Ones and imprisoned at the St. Aegolius Academy for Orphaned Owls, the legend become reality. There, they meet the evil king, Metalbeak (voiced by Joel Edgerton) and his queen, Nyra (voiced by Helen Mirren). Soren and his new friend Gylfie (Emile Barclay) escape St. Aegolius with the help of a guard named Grimble (Hugo Weaving). Together with two other owls, Digger and Twilight, the band embarks on an arduous journey to seek for the Guardians to save the owl kingdom from the Pure Ones. When they reach the city of Ga'Hoole, Soren and the rest are trained by an old warrior named Ezylryb (Geoffrey Rush). They must learn fast before the evil Pure Ones succeed to dominate the owl kingdom. The storyline, albeit a bit too dark for younger kids, is fantastic. When I saw this movie's poster in the cinema quite some time ago, I didn't intend to watch it at all. However, when I watched it on DVD this time round, I found myself utterly captivated by the fantastic storyline, awesome animations, and the superb slow motion scenes whereby you can see every rain droplets and every spark from the owls' metal talons when they clash with one another in war. It's like watching 300 but the warriors are owls. Overall, this is a really good animated movie. It's definitely a must-watch movie!